Tue., Oct. 23, 2018, 3 p.m. Think of every military action movie cliche you can. The maverick hero who’s just an average guy. The uptight rule-following second-in-command who learns a good lesson. The token concerned woman who has one line. Enemies who aren’t so different after all. 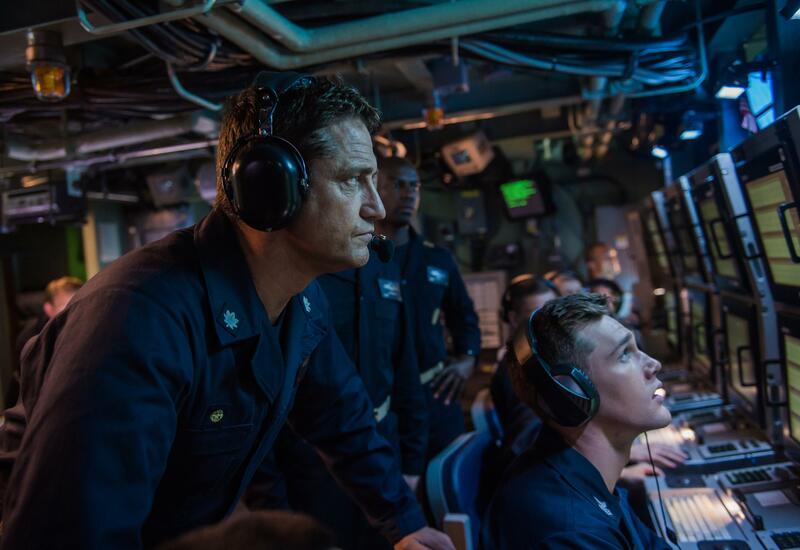 So many of these hackneyed stereotypes are thrown at the Gerard Butler-starring Navy thriller “Hunter Killer” that you have to wonder if this is the “Scary Movie” of submarine movies. Directed by Donovan Marsh, and with an army of action producers behind it, “Hunter Killer” is just this side of a parody. But there’s so much fun to be had with formula, and if you aren’t taking “Hunter Killer” all too seriously, the film is a hoot, even if that’s not exactly what the filmmakers were going for. Based on the novel “Firing Point” by George Wallace and Don Keith, adapted by Arne L. Schmidt and Jamie Moss, the plot concerns an underwater dogfight in the Barents Sea that’s keeping World War 3 at bay, while on the surface, a coup d’etat is unfolding at the Polyarny base in Russia. When the USS Tampa Bay goes down with 110 sailors, the target of a Russian torpedo, Capt. Joe Glass (Butler) is yanked out of the Scottish highlands, where he’s bow hunting moose (naturally). He’s plopped at the helm of a “hunter killer” sub, the USS Arkansas, to figure out just what is going on in Kola Bay. If there’s a playbook, no one’s following it. Joe Glass, well, he’s not a regular captain; he’s a cool captain. “XO, would you rather be right or to be alive?” he asks his executive officer (Carter MacIntyre), who sputters every time Glass goes rogue, picking up a few Russian sailors from their sunken sub and piloting the Arkansas into a treacherous fjord littered with mines and sensors with the help of Russian captain Andropov (Michael Nyqvist). In “Hunter Killer,” military loyalty is a higher order that takes precedence over any politicking, and Joe needs to trust in that combat-forged code. Literally everyone’s going rogue, including the Russian defense minister Durov (Michael Gor), who usurps the handsome but very dumb Russian President Zakarin (Alexander Diachenko), not to mention the U.S. Department of Defense and the NSA, headed up by Rear Admiral Fisk (Common) and Jayne Nordquist (Linda Cardellini) respectively. They cook up a harebrained scheme for a special forces unit to extract Zakarin and get him on the sub. Gary Oldman, making an appearance as the Chairman of the Joint Chiefs, is positively apoplectic. For all the laughable cliches, Marsh and cinematographer Tom Marais do shoot the movie with dynamism and verve. The camera is almost always moving, and they bring spatial awareness and geography to the cramped space. Below the surface, the details do feel real, even if ripped from “The Hunt for Red October,” but on land, everything is shot with a soft-focus lens and enhanced with way too much CGI. “Hunter Killer” needs its radar calibrated, because while it bounces between serious and silly, it never quite finds a suitable place to land. Published: Oct. 23, 2018, 3 p.m.